My cravings for cool salads continue as the temperatures hold steady at "decidedly hot." This chicken salad is a favorite of mine that I've been making since I was in college. I got the idea from the lunch place I used to frequent during my first internship. A tart and creamy salad with sliced nuts, dried fruit, and fresh diced apples, it was delicious on the buttery croissants they used to serve it on. As much as I love croissants, I've since replaced them with a slightly heartier cranberry walnut bread, which stands up better to the creamy salad and makes it perfect for a bagged lunch or picnic. The combination of sweet and tart is what makes this one work, so don't shy away from the addition of apples and lemon; I promise it works! The Greek yogurt in the dressing also lightens it up a bit, but if you prefer, you can use sour cream or a bit of buttermilk instead. I love this with a generous handful of watercress tucked in (or my favorite Upland Cress! ), but of course it's optional. If you prefer, you can also eat this as an entree over a bed of greens (I served it this way at one of my recent brunch parties and it was a hit). 1. Season the chicken breasts on both sides with ground black pepper and sea salt. Heat the oil in a medium skillet over medium-high heat. Add the chicken breasts and sear on both sides (2 minutes each). Pour in the chicken broth and garlic cloves, and bring to a simmer. Let the chicken simmer until it is cooked through (about 10 minutes). Remove the chicken from the heat and let cool on a plate. 2. In a large bowl, combine the mayonnaise, yogurt, lemon juice, lemon zest, oregano, plus a 1/2 teaspoon each of sea salt and black pepper. Whisk well and fold in the diced apples, minced shallots, sliced almonds, and cranberries (if using). 3. Cut the cooled chicken into cubes (or use a fork to shred, if you prefer), and add to the dressing. Toss well and taste for seasoning. Cover and chill in the refrigerator for at least one hour (up to 24). 4. 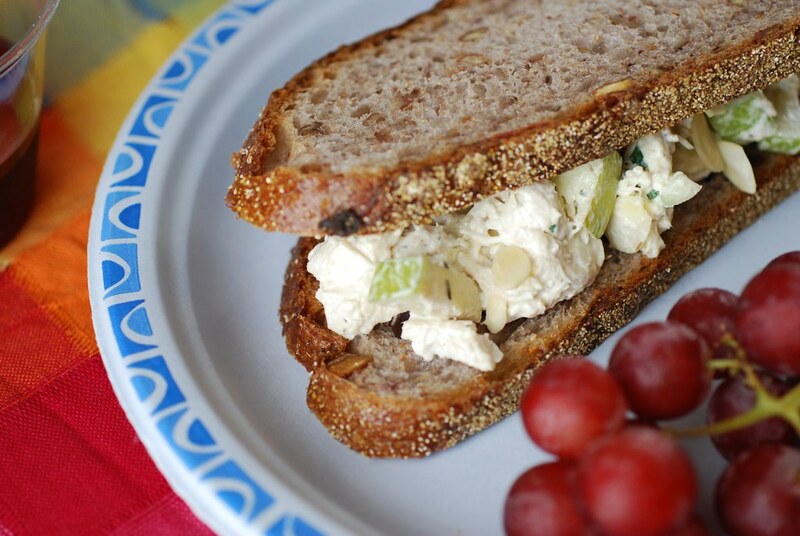 To serve, make sandwiches using sliced cranberry walnut (or other desired) bread. Top each with a small handful of watercress. Serve immediately or wrap in parchment paper and serve for lunch.